When Chris Palmer scored 47 runs against Sedgefield last week he became Newton Aycliffe Cricket Club’s all-time leading run scorer, a record that had stood for 14 years. Chris’ innings took him to a total of 9,168 runs, surpassing the previous record of 9,159, and at 34-years-old he hopes to go on and set a record that will stand for many years to come, with his next target being to pass the 10,000 mark. 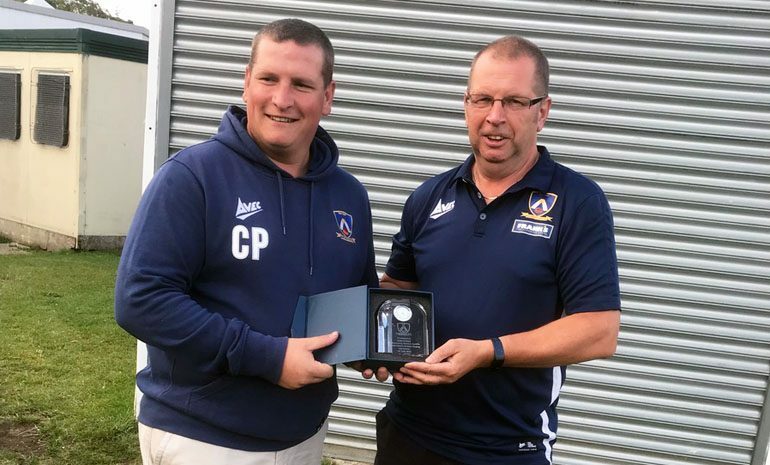 To commemorate Chris’ achievement he was presented with an engraved crystal clock by Club Chairman and proud father Ian Palmer. Chris made his senior debut as a 15-year-old and has been a one club man playing 19 consecutive seasons. He also holds the club’s appearance record having played in excess of 500 games. He was club captain from 2009 to 2015 and has won the batting averages three times from 2011 to 2013.